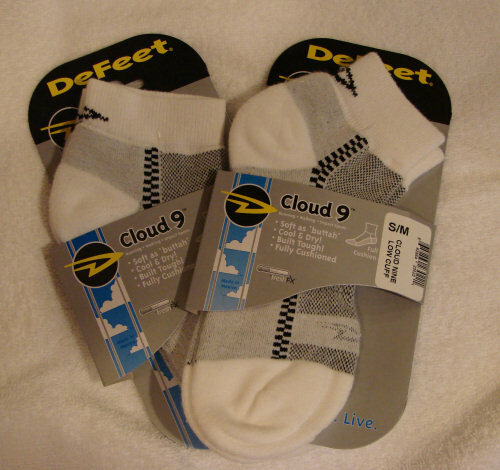 The DeFeet Cloud 9 Socks are part of the 'Specialty Sock' line. This line uses a Cool Max/Cordura woven yarn and is made for high performance in just about any situation. 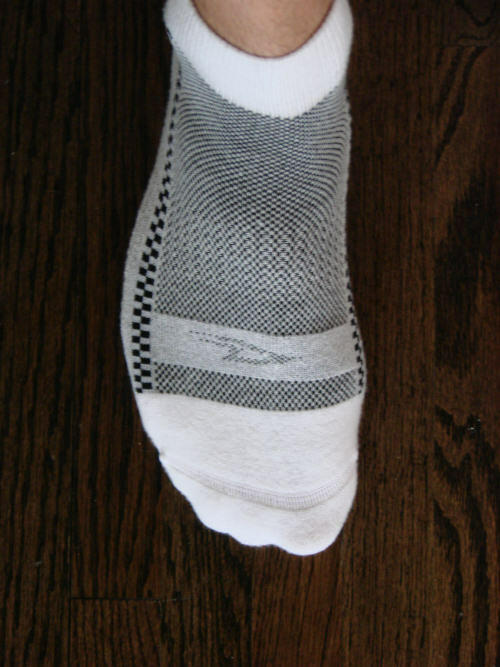 The Cool Max portion allows the sock to have great moisture control along with great comfort. The Cordura portion gives durability and strength which together with the Cool Max, seems to give this sock amazing comfort and durability. The Cloud 9 has a seamless toe, arch support and is only offered in two sizes due to its great stretch characteristics. In case the user forgets what size was purchased, it is stitched on the inside of the heel portion of the cuff, which in my case it had 'S/M'. 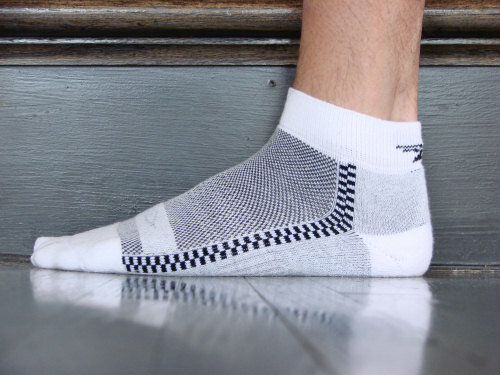 The whole sock is stitched with different black/grey and white checkered patterns that create different portions of the sock and in turn has a specific function. The Cloud 9 is offered in Quarter and Lo-Cut styles. The DeFeet Cloud 9 Socks look to be very comfortable when first seen. Two pair of Cloud 9 socks were shipped in a bubble protected envelope. When I first saw them I thought that they were going to be too small. The problem I have with socks is that I wear a shoe size of 9.5 US (42.5 Euro) so most of the time my sock size is high on the 'Small' size chart and low on the 'Large' size chart. So I had to make a decision whether to order a SM/MD or LG/XL. I ordered the SM/MD and hoped that they don't shrink very much. The LG/XL size fits men's shoe size 9.5 - 14 US (43-47+ Euro) which to me is a big size difference. I didn't want to take a chance of 1 or 2 in ( cm) of sock hanging of the end of my toes if they never drew up to fit my foot. After removing the socks from the display package I tried them on. They stretched much more than they looked, meaning that they looked too small before putting them on. After putting them on, they felt really nice. All of the features of the arch support, seamless toe and cuff fit perfect in the right spots of my foot. Right now they fit great and the size is just right. I am concerned that after I wash these then they will draw up and be too small; but that is part of the reason why I am testing them. With some warm months coming up, I am looking forward to testing these socks out on the trail. I personally have never worn an athletic or hiking sock that has held up as well as the DeFeet Cloud 9 socks have so far. Two months is not a long time for wear on a sock but by now, most of the socks I own, they are way too small due to washing and drying. As seen in the picture above, compared to the same type picture from my Initial Report, the socks appear to fit my foot the same after two months of wear. I have worn the DeFeet Cloud 9 socks on several day hikes and mostly on the weekends while in town, around the house and mountain bike rides. I have really put these socks through different elements to see how they performed. Most of my day hiking has been in the Pisgah National Forest, Jones Gap and Julian Price Park. All of these trips were hikes that ranged from 2 to 8 miles (3 to 12 km) in length with elevations from 1,100 ft to 6,600 ft (335 m to 2012 m). The temperatures ranged from 45 F to 85 F (7 C to 30 C) and mostly under clear to cloudy skies. Most of my bike rides have been on designated trails and some in a rural area of town. I have also worn them on every weekend since my Initial Report while making trips around town either by walking or driving. During the days that I wore them hiking, my feet were very comfortable and cool. The heel and toe area absorbed much of the impact when jumping or walking onto rocks or roots. While the sock was on my feet and in the shoe, I could not pinpoint any discomfort or hot spot due to sweaty feet or rubbing from the shoe. When it was time to take the sock off, the sock would be damp from sweat but my foot would be mostly dry. 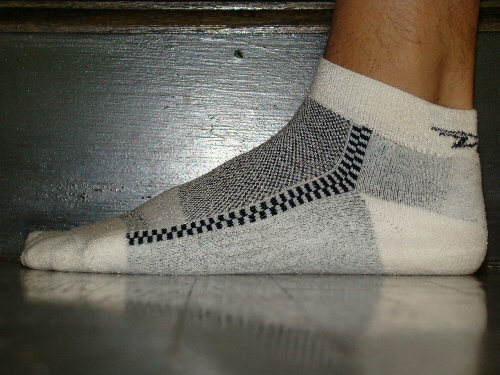 This indicated to me that the sock wicked the sweat away from my foot as it was designed to do. I think what I am most impressed with is that the sock shrank about 1/4 of its original size after one washing and drying but when I put the sock on my foot, the sock stretched to fit my foot as it did brand new. The instructions for washing read to machine was in cold water, tumble dry on low and for there to be no chlorine bleach. To me, this is where all of my other socks fail. I think that when I buy a properly-sized pair of socks, I expect that they will fit after washing. It bothers me that after one washing of a pair of socks that they draw up 1/2 of the original size and they do not stretch back out to fit my foot. The cuff of the sock ends up down in my shoe. That is not the case with the Cloud 9 socks and I was very happy at my experience with them after the first washing cycle. I have been extremely happy with the way the Cloud 9 socks have performed. Not only while I am wearing them but after they have been washed approximately 24 to 26 times. All together I have put approximately 16 to 20 miles (25 to 32 km) on them and seeing the picture above shows how little they are worn after all of this. The fabric is pilling just a little bit but nothing major and it does not affect the performance of the sock. The arch support continues to be snug around the arch area and the whole sock itself still fits snugly to my entire foot. The socks appear to be dirty but that is from washing them and not using chlorine bleach. They are a little dingy but as long and they still fit and perform, it does not matter to me. I have to say that thus far, when wearing these socks, I do feel like I am walking on Cloud 9. The DeFeet Cloud 9 socks have continued to be my favorite low-cut socks for the summer. I have worn them for a total of approximately 45 to 50 miles (72 to 80 km). I have worn them from day hikes to mountain biking trips to everyday use around the town. The temperatures during these times have been 85 F to 100 F (30 C to 37 C) with high humidity during these past summer months. I wore them usually with the same shoes each time which were my hiking shoes, and the times on the bike were with a pair of bike shoes. At no time during these trips did I encounter any hot spots or blisters. My feet did get sweaty a good bit but the Cloud 9's performed beautifully and wicked the moisture away from my feet and kept them dryer than normal. Usually when I removed the socks, they were damp from the sweat but my feet were pretty much dry. I have washed them probably about 30 to 35 times in the washing machine with no bleach. The socks have remained dingy like the photos in the Field Report. 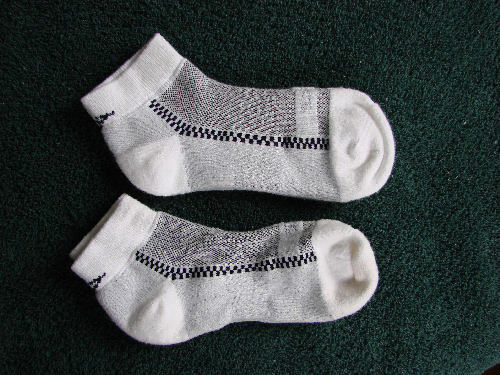 They still look the same and have pilled a little bit but not enough to interfere with the performance of the sock. I am curious to see if bleach would make them whiter but since they are hiking socks it does not really matter if they are a little dingy. I don't want to affect the integrity of the fabric by bleaching them so I guess I will continue to just wash them with colors. Like I mentioned in the Initial Report, I was curious to see at the end of the test if the socks would shrink from being washed. 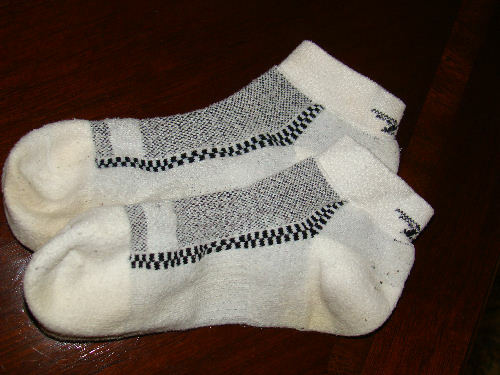 The socks have shrank just a little bit as seen in the picture in the Field Report noted "after 1 washing". This is as much as they have shrank but the fit is still perfect. I was a little skeptical at viewing the socks after they were washed a few times thinking that they would eventually be too small, but that is not the case at all. The socks really do fit perfectly to my foot. The arch support is still snug and feels great next to my skin. The seamless toe and cuff are also very comfortable and have not been stretched beyond the limits of them retaining their shape. I have just been very pleased with the DeFeet Cloud 9 socks. I can't say much more than I already have about how wonderful these socks are. They do make you feel like you are walking on Cloud 9 when wearing them and I look forward to many more miles on them. Thank you DeFeet and BackpackGearTest.org for this opportunity.